View Project - "The REAP Project"
"THE REAP PROJECT" consists of a team of Sponsors and Advisers who plan to document the replication of Egyptian Artifacts, and processes of how the artifacts were made, by using materials and techniques that are as authentic as possible. 1. How did the Egyptians measure the Pyramids when they built them? 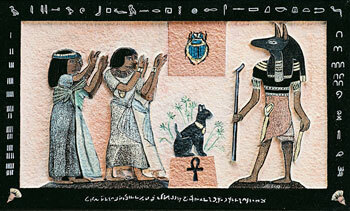 Answer: The Royal Egyptian Cubit! 2. How did we learn to read the Egyptians' hieroglyphic language, even though no human has spoken that language in over 1500 years? The plan is to show how the Royal Cubit and the Rosetta Stone were created, and document the process for educational purposes. The first project plan is the replication of the Royal Egyptian Cubit. The documentary will show how the Egyptians may have prepared, polished, and etched the stone, and will describe the history behind the measuring device. Students from area schools and UMKC students will be involved in the filming, along with Anita Shikles, who is the artist on the project. Students will be given a hands-on opportunity to learn ancient stone working techniques. Anita Shikles will demonstrate the ancient techniques in comparison to modern stone etching techniques. Plans are also in the works for replicating the Rosetta Stone later in 2007. The documentary for this event will also include area students from a number of local schools and UMKC, and the replica will be housed at the Linda Hall Library at UMKC, upon completion. It is planned for the replica to be full size, and will be the ONLY known granite replica in the world. Filming for the 1st documentary took place at UMKC, on April 6, 2007. Students involved in the project include the following: Maranatha Academy of Shawnee, Kansas students: Chosen by essay were 3 5th graders from Linda Steinbrink's class: Taylor Gourley, Yonathan Fitsum, and Tristen Bergerhofer. These students wrote great essays about Egyptian culture and art. A number of their younger brothers and sisters were invited to also be in the documentary, as well as parents. These include 3rd graders, Chase Gourley, Sharon Fitsum, and Makayla Menglistu. One second grader was included: Zeru Fitsum. A number of the student's parents also took part in the filming. Other Maranatha Students in the documentary are Kara Klemmer, 8th grade, Nick Keegan, 8th grade; and Samantha Shikles, freshman. Thank you to Kansas City Monument, and Freeman Monument Company for providing stone pieces, and their help in preparing stonework. Additional Sponsors may be added. Naming and intellectual property rights are subject to negotiation.